Complete renovation of an approximately 100 year old 3-family with a 2-unit new addition, this development will create a total of five new LEED Platinum homes. Each home features a unique multi-level layout (duplexes and triplexes) ranging in size from 1,477sf to 1,904sf with private outdoor space and deeded parking, all equipped with electric vehicle charging stations. In addition to Chartier Group's standard offering of triple pane windows, multi-zone heating & cooling, fresh & filtered ventilation air, airtight construction and superinsulation, the 5-unit development will feature a common fitness center for the residents, designed with the health and wellness of the future occupants in mind. A 4-story (with mezzanine and basement), mixed use development consisting of ground floor retail and three, large family-friendly homes. The retail space will house Bellamy Kitchen, a commercial kitchen and culinary incubator space. The three residences were designed to easily accommodate a home office and create a live/work opportunity. All homes feature private on-site garage parking and private outdoor space. There will be a 4-bedroom, 3.5 bathroom duplex home with soaring 16’ ceilings, approximately 2,230 square feet of living space and private rooftop deck with NYC views. The first and second floors contain one home each, featuring 3-bedrooms, 2.5 bathrooms and approximately 1,710 square feet of living space with private outdoor space. The building features 4 duplex residences, approximately 2,700 sf each. Each residence boasts 4 bedrooms, 3 bathrooms, private on-site garage parking and private outdoor space. The building was designed using Passive House standard, earning a LEED Gold certification from the US Green Building Council in 2018. The building features 4 residences, approximately 1,500 sf each. Each residence boasts 3 bedrooms, 2 bathrooms, on-site private storage unit. The penthouse possesses access to an approximately 350 sf private roof deck, surrounded by a green planted roof. The building was designed using Passive House standards and is slated to receive LEED Gold certification from the US Green Building Council. 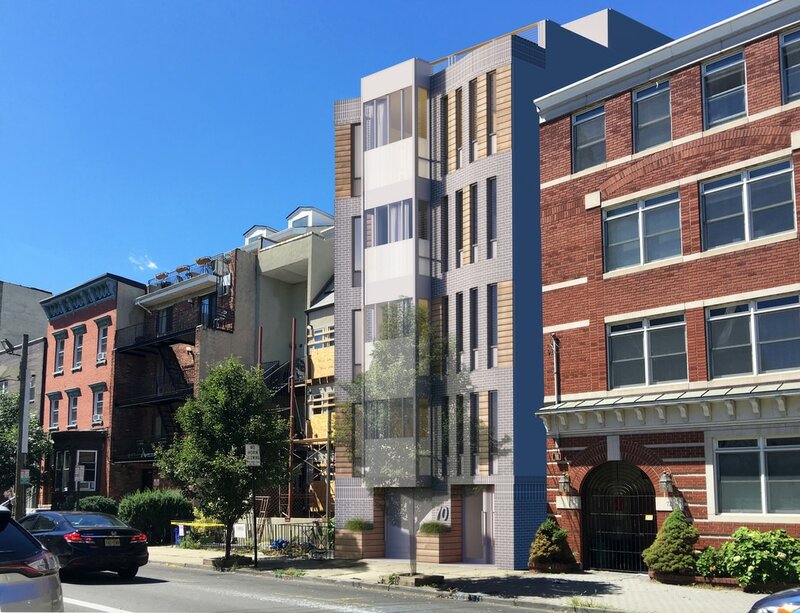 83 Waverly Street, once the home of the Commercial Blue Print Company, is currently being re-purposed and developed in to Print House: a new, environmentally sustainable condominium development located in Jersey City, NJ. The building is designed using Passive House standards and is slated to receive LEED Certification from the US Green Building Council. The building features 1, 2 and 3 bedroom homes, ranging in size from 881sf to 1.644sf. Each home features private outdoor space, deed garage parking space with electric vehicle charging stations, and storage for bicycles, strollers, etc. Winner of the USGBC's 2017 "LEED Innovation Project of the Year" AND the NAHB's "Excellence Award", Union Hill is a two phase development located between 300 and 310 6th Street in Union City, NJ which achieved LEED Platinum Certification and has the distinct honor of being the first LEED certified project in Union City. The dual phase development was designed using Passive House standards to significantly reduce the burden on the existing gas, electric, water and sewer infrastructure while reducing resource consumption. Phase I was built on vacant land, completed in March 2015, and now boasts three 3,000 square foot townhomes. Phase II replaced an existing dilapidated 3- family home, was completed in September of 2015, and contains four duplex apartments, ranging in size from 1,840 square feet to 2,240 square feet. Chartier Group’s commitment to sustainability is seen throughout the development. Using porous concrete for the first time in the city with storm water retention tanks, a new bar has been set in managing localized flooding to help ease the stresses on an outdated sewage system. Each unit is wired to charge an electric vehicle in the dedicated, on-site parking spot in addition to providing covered bicycle storage space.